Tampons a luxury? Well, not really but Cora makes them feel that way. I received this "luxury" tampon last month in the mail and I was impressed. They come with a nice little pouch that can sit on top of the toilet and nobody would ever even know it was tampons unless the investigated. Some of the tampons came in cylinders so they can be thrown in the purse without damage, and they came with a case that held three, which can be used for the same purposes. 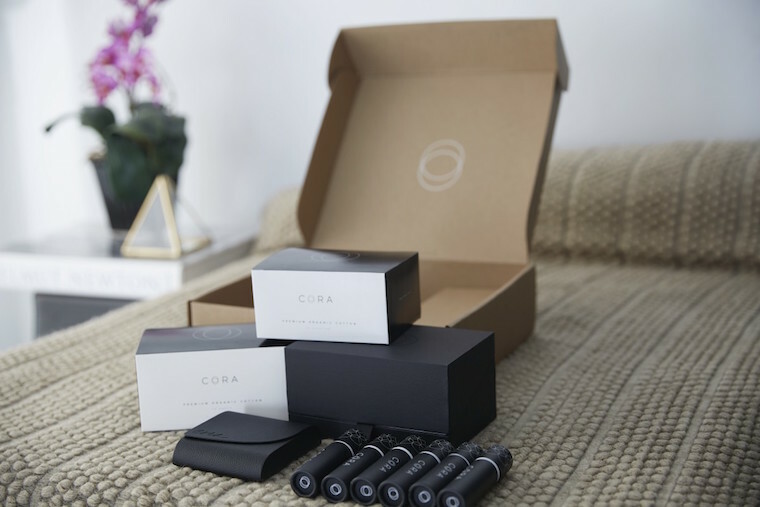 The slick, black casing definitely gives these tampons and more sophisticated touch and adds a little elegance to a rather non-elegant thing. The best thing? These tampons work. Not only do they look pretty AND organic, but they actually work too. Even better, sign up for their delivery system and you can have these awesome babies delivered to your door every three months. No more walk of shame at the checkout line, nope....have these privately delivered to your home AND have your preferences set up for them! Have heavier periods, well then you can select the option of having MOSTLY super tampons delivered. If you are a lighter period kind of girl, you can have the regular and slims delivered, or a combo of all. They give back too! For every month you have delivered to your home, Cora will deliver a month of pads to a girl in need. Yep...awesome company! They have a phenomenal, attractive product, that is organic AND they give back. It is a WIN-WIN for everyone. Prices start from about $7 a month, so it is affordable too! USE CODE: PAIGETWENTY1016- You will receive 20% off their subscription order. The code is good through November 8th.